The Minox is the longest lived subminiature camera format with numerous models and accessories but retaining the design concept that Walter Zapp invented in 1932. The brilliance of the design, the quality of construction, attention to detail, creating outstanding photographs from a device that can be hidden in the palm of your hand has endeared the Minox to photographers for over 65 years. The Minox's association with espionage was not to the inventor's liking. Some of the first production cameras where indeed used by the intelligent agencies. The Minox's use for photographing documents has possibly been the most enduring image of the tiny Minox. Several metal models where produced in chrome, black and gold with sterling silver and platinum LX and the titan finish on the TLX. The only true chrome plated models are the CLX and the 100th Anniversary Edition celebrating the birth of Walter Zapp. All Rigas are stainless steel cases with chrome plated brass dials. See the history chart on the variations with dates and pictures, the Minox Serial Numbers table for year of production and changes in specification and the tables of variations for summary of engravings, filters, colour etc. The common finish is often referred to as silver, matt chrome, satin and matt or brushed aluminium. 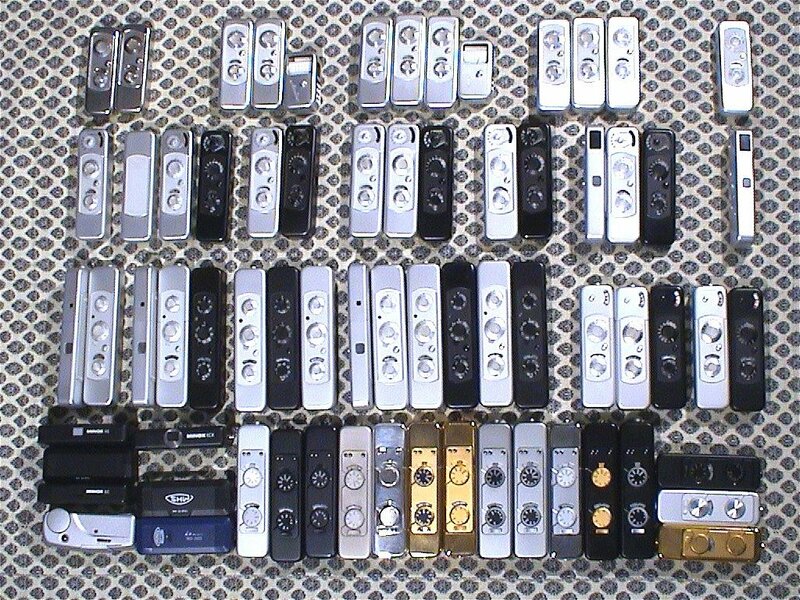 There are some polished aluminium models (with a mirror like surface), possibly made by Minox craftsmen, and a few claimed to have been made by Minox apprentices in a piebald black and chrome. The EC and ECX models are black plastic with the EC also being made in white and brown (according to Moses, but deigned by Minox). There are some professionally painted yellow, red, white, blue, silver and chrome ECs, some with Ferrari or Porsche logos have been sold on Ebay. These are not original Minox productions. The post-war Minox III-IIIs seems to be the closest to what Walter Zapp's prototype of 1932 was, but he camera he really wanted to produce was the Minox BL of '73-74 vintage. There were no meters of size and accuracy available to incorporate in 1932-8. The simple, mechanical camera with an accurate CdS meter is likely one of the nicest combinations of all, but it didn't sell well compared to the auto-exposure C model. The Minox AIIIs lost popularity quickly when the B came out in '59. By '63 Minox was offering a $30-45 discount on the IIIs as a purchase incentive. Having a meter in the camera makes a huge difference to ease of use. The IIIs was in production the longest but the B outsold it by 2:1. The Minox AX camera is essentially a BL without the meter, in the LX series style/ergonomics fully mechanical but so few made that it is also rare and expensive. The LX was launched at Photokina in 1978 with improved electronics and a top speed of 1/2000th. Since then, to the traditional matt aluminium, black and gold finishes have been added special editions with finishes in sterling silver, platinum, titanium, black with gold, black with luminous dials and chromium plating. This gives the LX a production history of 27 years longer than the Minox A or B cameras. but has sold less than 12% for all variations compared to the Minox B which was manufactured for 24 years. There has been a long term relationship between Minox and the Minox Processing Laboratories in New York. Don Thayer, Sr. saw the camera in Germany and arranged to have it imported to the US. It was through the Minox Processing Laboratories that the Minox gain a following in the USA. The Minox was first imported by Kling Photo and later Minox USA. For a short while in the 1980s MPL was also Minox USA. Don Thayer, Jr., took over the company after his father's death.